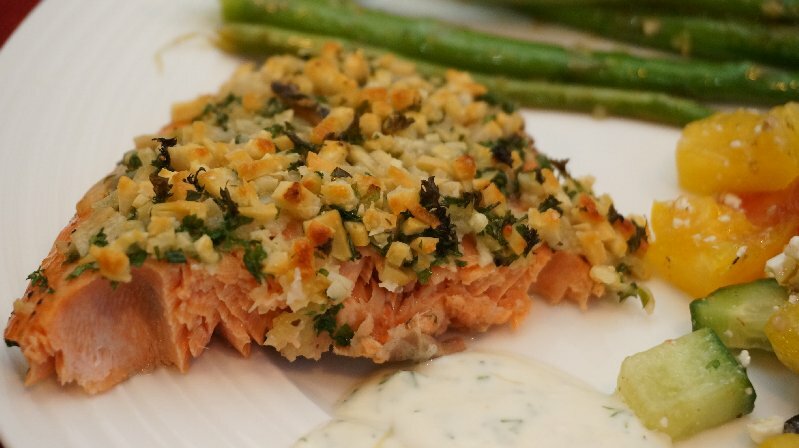 Here's a deliciously simple recipe for salmon. Using chopped rather than grated Parmesan ensures a satisfying crunchy coating. If using dill sauce, prepare that first and set in refrigerator to blend flavours. Place salmon, skin side down, on a parchment or foil covered pan. Place a piece of parchment paper loosely over salmon and bake for about 8-10 minutes. Meanwhile, combine parsley, dill and Parmesan cheese in a small bowl. When the 10 minutes is up, remove salmon from oven. Spread the soft butter over the salmon and pat on the herb/cheese mixture. Place back in oven and bake uncovered until fish flakes with a fork. This will not be long. If you like you can brown the salmon under the broiler for a minute or so but watch it closely!! Remove salmon to serving platter, leaving the skin on the baking pan. Combine all ingredients and mix well. Refrigerate until serving time. This sounds absolutely delicious! I really like the process, too. If each person has a 6-8 ounce serving you can serve 4 with this. How do you "leave the skin on the pan?" Does it peel off that easily? Yes, Betsy, when the salmon is cooked, you can very easily lift the meat right off of the skin. I use a pancake lifter to do this. Oh Bev that has me drooling!! I am so jealous of you access to fresh wild salmon - we love salmon! This recipe looks fantastic.